I Love Freebies | Your online guide to freebies, hot deals, and more! In 1988 Martin Pistorius fell ill. He became unresponsive and doctors thought that he was brain dead. That was far from the truth. Marin was well aware of his surroundings and could see and hear everything. He was trapped inside his own body unable to move. This book tells the tale of a remarkable true story of Martin’s life. While reading, I could not put down the book. I was captivated by his story telling and horrified at the ordeal he went through. I did find the chapters to be a bit sporadic at times, especially near the end of the book. I felt like he had so much to say that to remember that chapters were disjointed. Even so, I highly recommend this book. It makes you think how lucky you are and things could be worse. A lot worse. I give “Ghost Boy” 4 out of 5 stars. 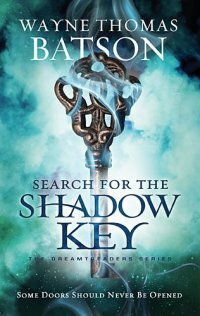 Search for the Shadow Key by Wayne Thomas Batson is the second book in the Dreamtreaders trilogy. It follows fourteen year old Archer Keaton who has the fantastic ability to enter his dreams, known as a Dreamtreader. Archer Keaton is the last Dreamtreader and must find a way to save his family and friends from the new Nightmare King and the Trendrils. He must seal the Dream Fabric or the barrier between dreams and the waking world will merge. Filled with imagination, fantasy, and temptation, this epic fantasy trilogy was captivating and held my attention. This second part of the Dreamtreaders trilogy is a superb continuation and I honestly can not wait to find out how it all comes together in the end. I received a free copy of this book from Thomas Nelson’s BookLook program but was not obligated to write a positive review. These thoughts are my own.